Oh, Mad Men. I binge-watched every season and loved watching your amazing characters (even some of the truly vile ones) and now I'm sad the show's coming to a close. I have no idea what to replace the show with when it ends. Ah, the decor and fashion of the 1960s! Joan, you are awesome! Peggy! What a badass! And, dammit, Don, I tried an Old Fashioned drink because of you and now I get ticked off when bars don't muddle it just the right way. And who knew I would be curious about what the characters would be reading? But I did. I perked up every single time a character had a book in their hands. Fair warning. I'm not particularly exceptional or truly committed with reading challenges. I join them and then I falter halfway throughout, and I have a hard time posting my updates. But, I couldn't resist putting something together (and something that has an extended timeline with no pressures) when I saw that the New York Public Library had developed a handy list documenting the books by episode and by characters, and even posted oodles of reading tidbits to further satiate your vintage needs. Thank you, NYPL! Here's the full list here and what I'll be referencing; more lists are linked below. I also created a separate site that you guys can all add your links to also, which minimizes the need for me to administratively manage posts, etc. In other words, I'm a little busy (lazy) so I don't want that to stop your eagerness. 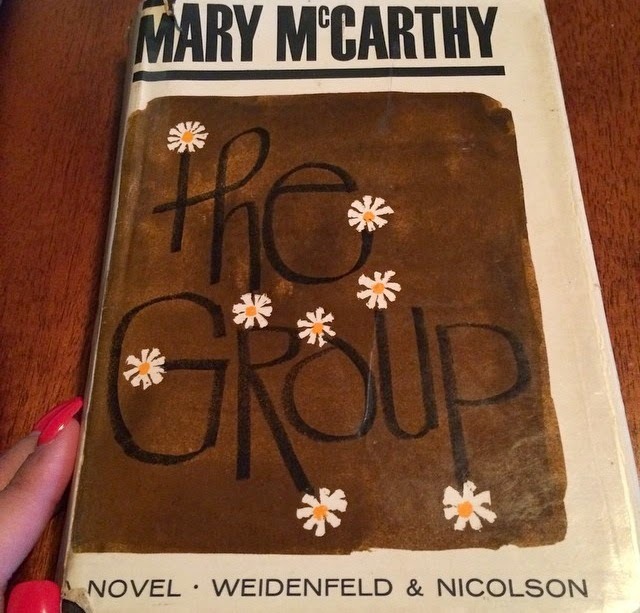 Mary McCarthy's most celebrated novel portrays the lives of eight Vassar graduates, known simply to their classmates as "the group." An eclectic mix of personalities and upbringings, they meet a week after graduation to watch Kay Strong, the first of the group, be married. After the ceremony, the women begin their adult lives--traveling to Europe, tackling the world of nursing and publishing, and finding love and heartbreak in the streets of New York City. Through the years, some of the friends grow apart and some become more entangled in each other's affairs, but all vow not to become like their mothers and fathers. It is only when one of them passes away that they all come back together again to mourn the loss of a friend, a confidante, and most importantly, a member of the group. Written with the trenchant, sardonic edge that can be attributed only to Mary McCarthy, The Group is a dazzlingly outspoken novel, as well as a captivating look at the social history of America between two world wars. Sign up below. If you write an announcement post, link it up. Pick books from the NYPL list here and here and here. Read the book or listen to the audiobook. Add the graphic from this post to your write-up. If you select books that weren't read on the Mad Men show, but were published (or were popular) during 1960 - 1968, just make a note of it in your post. Feel free to post about a movie or television show from that time period - the intent of this challenge is to celebrate the time and to say good-by to Mad Men. I skimmed because my eyes are still bothering me but it's funny that you bring this up. I am going to be reading Atlas Shrugged in July because it keeps getting mentioned on Mad Men! The Hubs watches that show and I've caught a few episodes here and there... I like the idea of reading books mentioned on the show. So fun. I looooove that decade and hate that decade for so many reasons. Great idea for a challenge! I'm just curious, why is the cut-off date 1968? The series ends in the year 1970. We gave up on Mad Men partway through the second season, because I just stopped liking Don Draper. I probably should have kept going, but we went on to something else. Right now we're waiting for the fourth season of Game of Thrones and watching all of Doc Martin. Sometimes I need a humorous show instead of True Detective, etc. The sign up link is not working, but at work so maybe it's blocked. I will check tonight or over the weekend. Consider me entered into your challenge! How fun! I wish I could enter. Heck, I wish I could finish the show; I think I'm still back in season 4 or something.